Handmade earrings - owners found, originally uploaded by zannnielim. 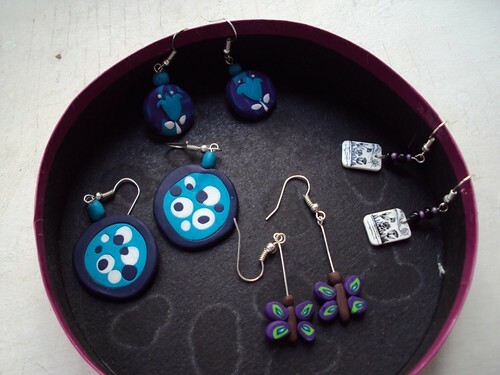 The round blue theme earrings shall be for a sweet young blonde lady who is rather much taller than the rest of them. The blue 'tulips' pair is for another blonde lady, she's my husband's sister. And the last pair which looks like black and white 'chips' is for a young woman with lots of tattoo all over her arms :D And she loves extreme sports like skiing and snowboarding especially.